Using EarthPure® Ozone Safe Refrigerant, the Tranquility 20™ is a breakthrough in efficiency - providing you with the greatest energy savings of any space conditioning system and unprecedented environmental protection at the same time. 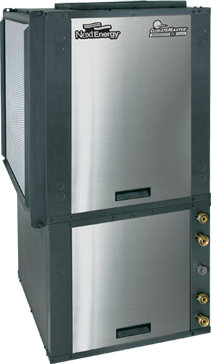 The Tranquility 20™ offers the latest in single-stage geothermal heat pump technology. Advanced scroll compressor technology and microprocessor controls allow the Tranquility 20™ to operate at the most efficient level for all weather conditions. The Tranquility 20™ has some of the industry's highest single stage efficiency ratings. Optional variable speed (ECM) fan design allows the Tranquility 20™ to "match" performance to meet all weather conditions. ► Extra high efficiency (EER 20 / 4.2 COP) produces significant energy savings.